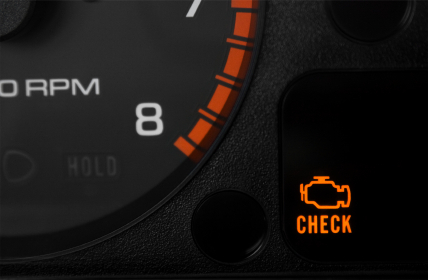 We have a new updated article on check engine lights, and how to fix them. Check it out!. A flashing CEL (Check Engine Light) is something serious to be concerned about. A blinking CEL indicates that your vehicle’s engine is misfiring, which could severely damage your catalytic converters. A misfire is when one or more of your engine’s cylinders are not providing power to the vehicle, with raw fuel possibly running into the catalytic converter. Engine misfire is a severe condition that requires immediate attention to avoid expensive repairs or even a car fire! Repairing this condition immediately is important to save you money and keep your vehicle running longer. The longer the vehicle is misfiring the more damage will occur. Even a non-flashing light could indicate a less serious misfire. Internal Engine Defect. This is the worst case scenario. Internal engine components are expensive and tend to be labor intensive to change. Example: cylinder head, pistons and rings, and timing belt/chain. The best way to diagnose and repair a misfire problem is to use a CarMD. CarMD reads your vehicles diagnostic system and uses the CarMD software platform to generate a report with most likely fix based on a pattern failure. A qualified automotive technician can then use this data to confirm and perform the required repairs. Misdiagnosing or ignoring a misfire can be very expensive. Typically the parts required to repair a misfire can be expensive and replacing the wrong parts does not address the cause of the misfire, possibly causing further driving to the vehicle. Furthermore, ignoring an engine misfire (even the vehicle drives “fine”) can create the need for very expensive repairs later, such as replacement of a catalytic converter (which can cost on average $1,500), or even the replacement of the entire engine (potentially upwards of $5,000). The worst case scenario is a car owner who keeps driving the vehicle because it “seems like it’s driving just fine.” If you ignore a flashing check engine light it is entirely possible that the vehicle burns up the catalyst and causes engine damage. The fix would then be something severe and extremely costly like a catalytic converter(s) or engine replacement which cost on average $1,150 and upwards of $5,000 respectively to fix. Maintaining your vehicle and addressing issues like a misfire quickly maintains vehicle safety, fuel economy and longevity.